Add a little MAGIC to your dining experience! 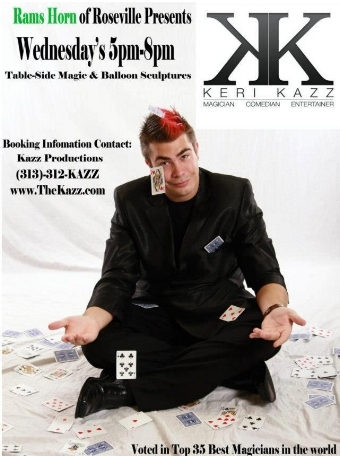 Keri Kazz is an innovator nation wide on his live magic performances to help boost attendance in business's. Let his creative mind help your business by bringing an unforgettable experience for your guests. Even more important some unforgettable perks to your business. ★★★★★-who thought family night would be bigger than our weekends? Keri’s skill in magic and marketing are simply the best! These family-focused nights are the added boost you need to turn your slowest nights into a packed house. This program helps to create a loyal family clientele that will frequent your restaurant every week. Create a “Kid’s Only” special: Free/reduced selected meal with the purchase of an adult entree. Encourage possible fundraiser clients to host their event on this night for the added entertainment bonus. Magician is present 2-3 hours. Program includes live magic and balloon twisting - free for all guests and special balloon creations for birthday celebrations! Wait times can lead to many people turning around and leaving before enjoying your restaurant. Increased wait time on food can lead to guests being rude to servers. Live Magic Nights are a simple and fun solution! Magic is a wonderful, interactive way to keep guests entertained and unaware of time flying by! Magician is present during high peak dinner hours for 2-3 hours. Program includes a calm and fun attitude from the magician while entertaining tables and those waiting to be seated. Balloon twisting available on request as well as special tricks or creations for birthday guests! Have a special event coming up? Enhance the dining experience and bring in live entertainment in the form of magic or balloon twisting to add a little extra for your guests! Entertainment can be customized to serve the theme of the event! Thats easy! Posters, postcards, social media, banners in the restaurant. We have everything covered! Each advertisement custom tailored to your restaurant or event! Schedule your FREE promo night today! What is a promo night? Keri will come in FREE of charge and give you a sample night of his work. He will mingle with the guests, the staff and you! Think of this like a test drive with a new car!